Over an average lifespan, they say you'll eat ten spiders in your sleep. 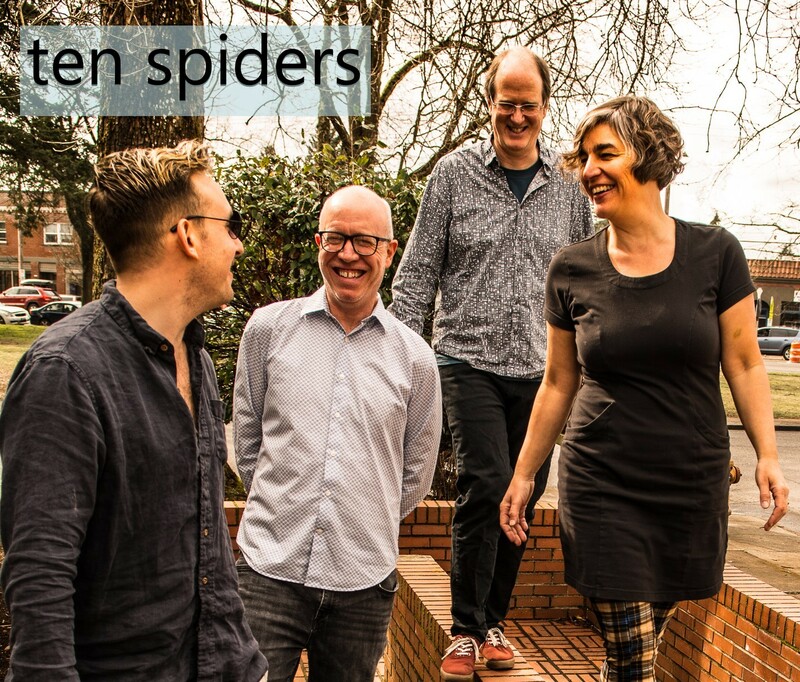 Ten Spiders is also a roots rock band that's been surprising diverse audiences not just with gross urban myths about their unsuspecting sleep-time diet, but also with an entertaining blend of original music. A healthy serving of sassy and thoughtful songs will be served in this five-course, very-much-awake meal of rock, folk, funk, bluegrass, and jazz with a cover or two for dessert. Philly-based Ten Spiders started as an acoustic trio and grew into a regional roots rock jam band over the course of the late 90s and early 00s. Over a decade, they played over 800 gigs in 10 different states and appeared live on community TV and radio. With banjo, electric bass, and drums at the core of every recording, they released two records, "Midnight Snack" and "Sun's Glow". The core members of the band, Maria and Steve Cahill, moved to Portland Oregon and took a break from playing out, but the songwriting continued. Fast forward to October 2018. Ten Spiders has played a handful of venues in Oregon over the years, but they've got some pent up energy. The same trio from Philly records 18 songs live in a marathon 10-hour session at the Hallowed Halls, except now Maria has replaced some of her banjo parts with the voicings on her grandfather's hollow-body electric guitar. They luck into working with Justin Phelps, a highly skilled person who has engineered sound for some of their favorite bands like Mars Volta, Cake, and Galactic. Ten Spiders expects to release their third record in summer 2019. Until then, they are ramping up their live shows excited to share this new material. Still heavily influenced by the diverse Philly live music scene, their songs are folky, but not folk; rocky, but not rock; funky, but not funk; jazzy, but not jazz; and bluegrassy, but not bluegrass. Set to appealing, upbeat grooves, thoughtful and witty lyrics reflect the angst and joy of life in the "modern world". Maria possesses a powerful, emotional voice, developed from 20 years of public singing, with a range that might growl out low notes or croon the sweetest high notes. She is the primary songwriter preferring upbeat music with thoughtful and sometimes witty lyrical insights pulling from a variety of musical genres that have inspired her, especially progressive and roots rock and jazz. For 20 years, Maria played the banjo exclusively, and studied under the guidance of Rounder recording artist Tony Trischka (one of Bela Fleck's teachers). Now, Maria almost just as exclusively plays her grandfather's 1962 hollow-body electric guitar -- a Gretsch 75th anniversary model that he played in bands with Maria's parents and their brothers when they were growing up. 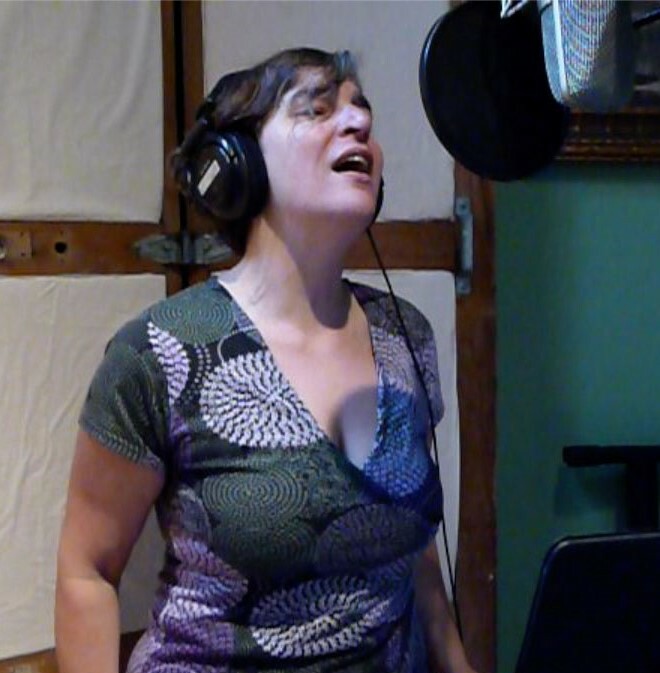 Maria has recorded on a variety of efforts including records by John Gannon, the Preacher Curlz (banjo/vocals), Ed Sullivan (B/V), Steve Quelet (B), Paul Dake (B/V), & Colleen McFarland (B). When Steve sings his unique harmonies, the 30-year musical rapport between this couple is evident. 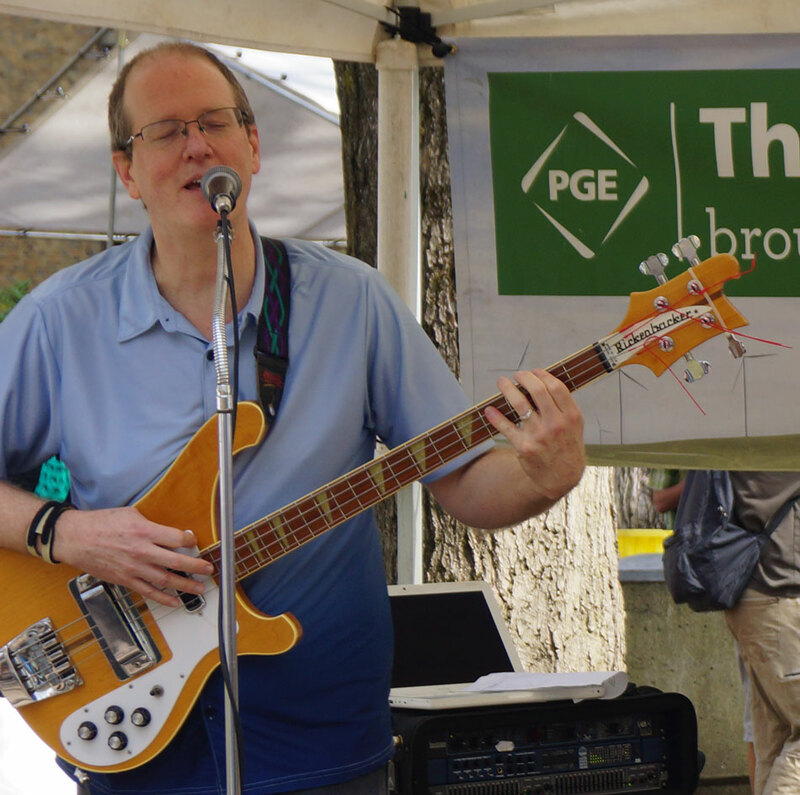 His creative, spontaneous electric bass playing career began in a grade school folk club and evolved from later rock influences such as Getty Lee and Phil Lesh. As the secondary songwriter, he uses the acoustic guitar to develop his songs and continues to perform some of them with guitar adding diversity to a night's worth of music. Steve has recorded with Ed Sullivan (bass/vocals) & Paul Dake (bass/vocals). Harrison Games has over 10 years' experience playing drums with a wide variety of collaborations under his belt. Deeply inspired by jazz, he pursues his passionate creative style, free from the influence of much else. 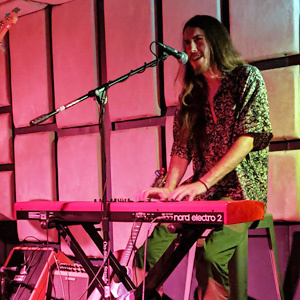 With an instinctive, easy-going attitude , Harrison adapts effortlessly and tastefully to the wide variety of Ten Spiders' tunes, from playing practically nothing to filling every nook and cranny with a wash of sound. 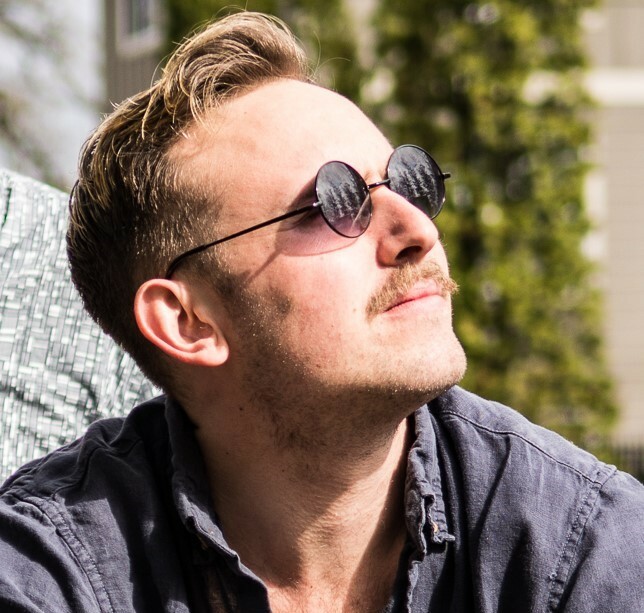 Currently, you can enjoy his addictive beats with two other Portland-based bands, Mr. Pete and Silent Temple. Ten Spiders has such great songs that all sorts of folx are lining up to be the fourth member. Any one of these additional band members might come fill out our sound. Having played and studied music his whole life, Amos Hart uses the fruits of his labour to create mystical Forest Folk, epic Heavy Metal, and hippied out Prog Rock/Jazz Fusion. Classically and Jazzically trained on the Piano and Bassvocals and "self" taught on Guitar, Recorder and Accordion, Amos plays in honor of our Mother EARTH, and the hope of peace among her children. With Folk-Metal band Eikthyrnir, Amos has recorded two full length albums and completed 2 tours spanning over a dozen US states and 2 Canadian provinces. As the leader and composer for Silent Temple, Amos has recorded three full length albums and played several shows in the Mid-west. Having recently re-formed the band in Portland Oregon, news about upcoming performances and recordings can be found at his website, https://treetemplemusic.com. John spent most of his musical life playing clarinet in orchestras and woodwind quintets, and saxophone in jazz big bands and college rock bands. Soon after college, he taught himself drums in a jazz quartet that garnered a few regular gigs in the area. Eventually, John spent three years managing, writing, and playing drums for an original rock/jazz/pop band. John's diverse musical experience has given him the insight, patience, and taste needed to hold it all together without overdoing it. He has three orginal album's worth of his own material that's worth checking out. John Gannon is the only member of the band with fan clubs on both coasts.